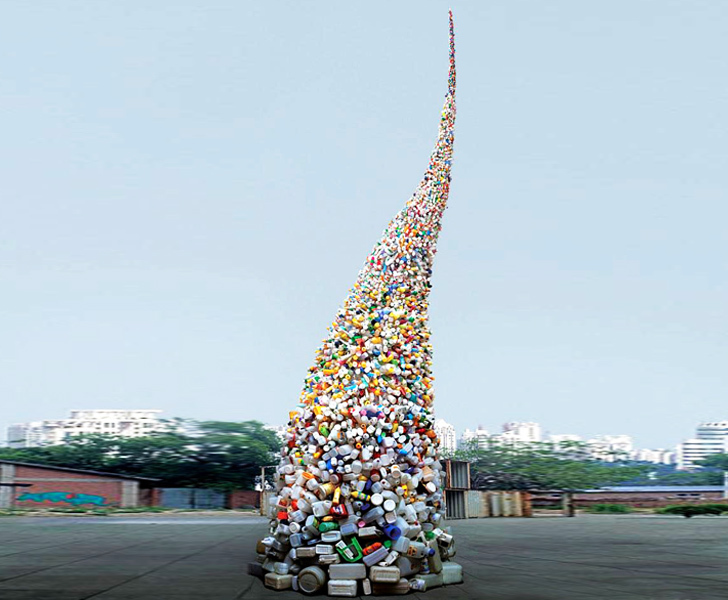 Whirling like a tornado from the ground, Wang Zhiyuan’s giant sculpture is made entirely from trash. Called “Thrown to the Wind,” the soaring tower rises 36 feet inside a double-height gallery called White Rabbit. 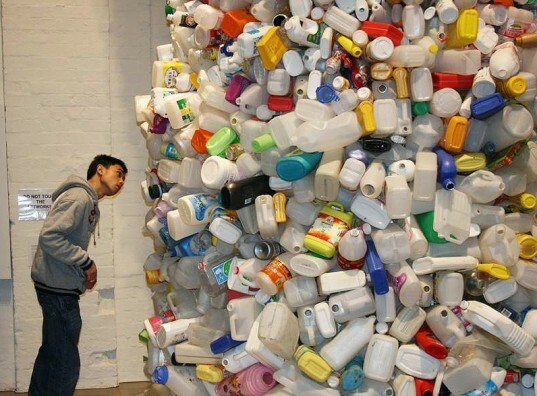 The sculpture recycles hundreds of plastic containers of all sizes to create an imposing yet graceful work, which aims to highlight the prevalence of litter and pollution in the artist's hometown of Beijing. The Chinese artist was inspired by the garbage and pollution that litters the streets of Beijing. As a reaction to the incredible piles of food and plastic trash he sees on the city streets and sidewalks, Zhiyuan decided to create an art installation that would bring this issue to the forefront. Through the sculpture’s presence as it travels, from gallery to outdoor installation, the artist hopes to encourage conversation about pollution, and incite change to tackle the problem. From afar, “Thrown to the Wind,” appears like a candy-colored Christmas tree. Underneath the myriad of plastics, Zhiyuan and his assistants built a metal framework, which holds the garbage components in place, all 36 feet up. Once the framework was assembled, sections of plastic bottles were strung together, slowly building up the circumference. As the tower got taller, Zhiyuan switched to smaller plastic bottles, letting the sculpture take shape to an elegant and curving point. At the wide bottom base, larger loose plastic bottles were placed around the installation, as if being sucked into the column of recycled trash. The resulting sculpture actually looks as if it has been caught by the wind, being sucked up into the air and into oblivion. Zhiyuan forces us to confront what happens to our trash when we throw it away, and makes an embarrassing statement that garbage does not just disappear into thin air once we’ve cast it aside. The Chinese artist was inspired by the garbage and pollution that litters the streets of Beijing. As a reaction to the incredible piles of food and plastic trash he sees on the city streets and sidewalks, Zhiyuan decided to create an art installation that would bring this issue to the forefront. Through the sculpture’s presence as it travels, from gallery to outdoor installation, the artist hopes to encourage conversation about pollution, and incite change to tackle the problem. From afar, “Thrown to the Wind,” appears like a candy-colored Christmas tree. Underneath the myriad of plastics, Zhiyuan and his assistants built a metal framework, which holds the garbage components in place, all 36 feet up. Once the framework was assembled, sections of plastic bottles were strung together, slowly building up the circumference. As the tower got taller, Zhiyuan switched to smaller plastic bottles, letting the sculpture take shape to an elegant and curving point. At the wide bottom base, larger loose plastic bottles were placed around the installation, as if being sucked into the column of recycled trash. The resulting sculpture actually looks as if it has been caught by the wind, being sucked up into the air and into oblivion. Zhiyuan forces us to confront what happens to our trash when we throw it away, and makes an embarrassing statement that garbage does not just disappear into thin air once we’ve cast it aside.